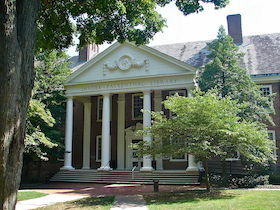 Franklin and Marshall College and its students make their home here. 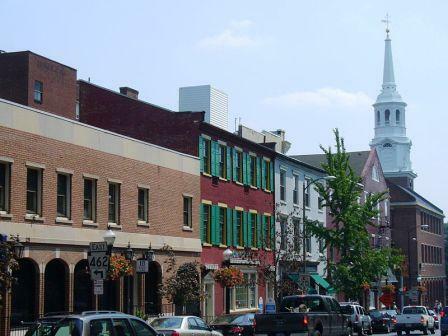 Lancaster, population 55,000, is the capital of Lancaster County in south-central Pennsylvania. Located in Pennsylvania Dutch country, it has pretty scenery. The town has a long and important history - Conestoga wagons and the Pennsylvania long rifle were both made here. President James Buchanan hailed from Lancaster, as did Thaddeus Stevens. Woolworth's, the first successful five and dime store, opened in Lancaster. Lancaster General Hospital and Franklin & Marshall are engaged in the Northwest Gateway Project, a $73 million conversion of a former Armstrong industrial plant into an exciting and major expansion of their campuses. Photo of Duke Street courtesy of and per license of Wikipedia and Scanlan. You can live in town or in one of the active adult or CCRCs in the area (see link at right). Zillow pegged the median value of a home to be about $133,600 in lat 2018, and calls it a "Very Hot Market" at this time. Lancaster has a rich history. It is also a college town in a pretty part of Pennsylvania Dutch country. The Central Market is the oldest farmers market in the country and a big tourist attraction because of the Amish goods offered for sale there. Many cultural institutions. Renovating the downtown area. There is a troubled history of drug deals gone bad and a resultant high crime rate. The city has had its ups and downs, including the current high unemployment rate. Lancaster is in the rolling terrain of south central Pennsylvania. The average July high is 85. The average Jan low is 21. The wettest month is September (4.5"). The Fulton Opera House is the oldest continuously operated theatre in the country, one of only three theatres designated as National Historic Landmarks. There are several art museums including the Demuth Museum and two others on the campus of Franklin & Marshall. There is an arboretum, James Buchanan's home, and a proposed museum for Thaddeus Stevens. Lancaster has several hospitals including Lancaster General and Community Hospital. Red Rose Transit Authority provides local bus service. Amtrak has a station in Lancaster, and there is also the Lancaster Airport.